Tacoma, WA, situated on beautiful Puget Sound, has a wealth of cultural opportunities, outdoor activities, restaurants, parks, and wildlife. Point Defiance Park brings visitors and residents in touch with fine beaches, hiking through old-growth forests, botanical gardens, and historic sites. Museum Row offers world-class museums focused on glass art, rare manuscripts, ship building, and classic cars. 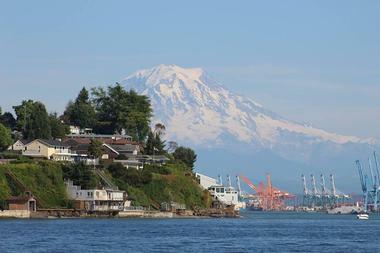 Tacoma is the nearest city to Mount Rainier National Park and the beauty of the Cascade Mountain Range. 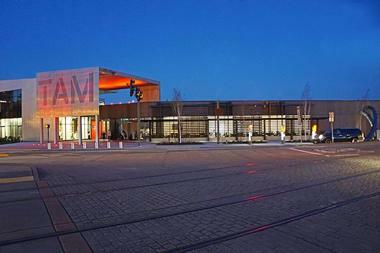 The Tacoma Art Museum was founded in 1935 and moved to its present location in 2003. Dedicated to collecting and showing Northwestern art, the museum owns over 4,500 items, including the largest collection of Dale Chihuly glass art and the largest collection of jewelry by Northwestern artists. 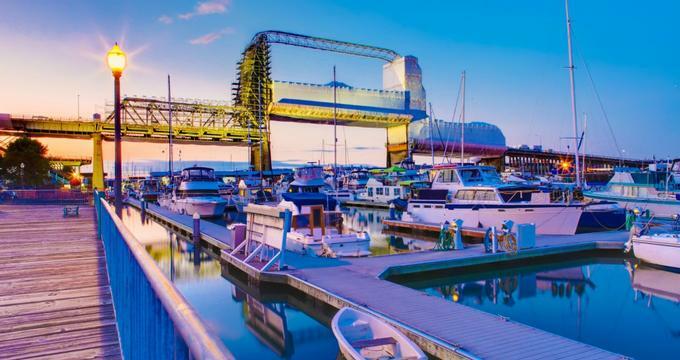 The Foss Waterway Seaport celebrates Tacoma's marine heritage and gives visitors a fascinating glimpse into an important part of Tacoma's history: boat and ship building. The museum is located in a century-old wheat warehouse and was once supplied by train, with the wheat shipping out to sea. Dedicated to heritage and education, the museum has interesting exhibits that will delight history buffs and boat lovers. There are models of commercial vessels made by ship builders in Tacoma; canoes made by the Willits Brothers from 1908-1967, early scuba equipment, vintage fishing lures, sculptures of marine debris, and classic recreational boats. The highlight of the museum is a working heritage wooden boat shop staffed by volunteer shipbuilders; visitors to the museum can watch and ask questions. The museum has a kids' craft area as well as knowledgeable and friendly docents. 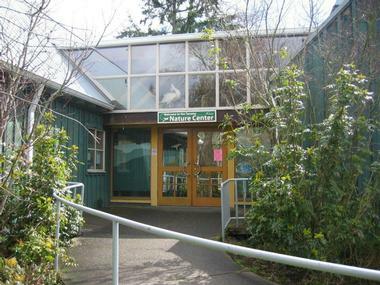 The Tacoma Nature Center is a 71-acre nature preserve with Snake Lake and its wetlands at its heart. The forested park is great for trail walks and wildlife spotting: there are cottontail rabbits, red foxes, raccoons, and black-tailed deer living here. The lake is home to wood duck, mallards, Canada geese, and western painted turtles. Inside the interpretative center there are displays on the ecosystems and animal life within the nature preserve. The nature center's highlight is Discovery Pond, a unique children's play area with a treehouse, a hollow log to climb through, boulders to scramble over, and a waterfall to play around. Naturalists are on hand to answer questions, while the nature center, which charges no admission, offers a gift shop, summer day camps, nature programs, and birthday parties. 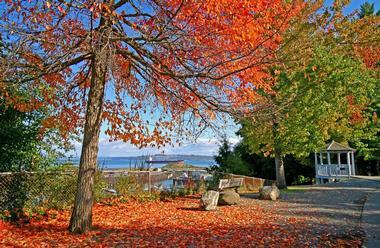 Five Mile Drive and its trails are in Point Defiance Park on Puget Sound in Tacoma, Washington. Vehicle traffic may drive through the inner loop of the park, while the outer loop is open only to pedestrians and cyclists. There are several well-marked trails that range in distance from ¼ mile to 4 ½ miles. The trails traverse old-growth forest, beaches, steep cliffs, and a delightful garden of rhododendrons. Hikers are granted spectacular views of Puget Sound, Vashon Island, and the Tacoma Narrows Bridge. Visitors lucky enough to see animals on their meanderings around the park should know that there are hefty fines for feeding the animals. Wildlife in the park includes bald eagles, mule deer, red foxes, squirrels, raccoons, while by the shore there are sea lions and the opportunity to watch humpback whales migrate. American Lake is located just south of Tacoma in the community of Lakewood. It is a popular destination for fishing; the Washington Department of Fish & Wildlife keeps it stocked with rainbow trout and kokanee, and there are natural populations of yellow perch, rock bass, largemouth bass, coastal cutthroat, and brown bullhead catfish. The Department of Fish & Wildlife has a two-lane concrete boat launch available. Two public parks on the lakeshore have beaches that attract swimmers, sunbathers, picnickers, and fishing enthusiasts; shore fishing available in both parks, there is lovely clean water in which to swim, and benches, picnic tables, and restrooms are available. Deer are often spotted, and bald eagles dive into the lake in search of kokanee. Harold LeMay was a Tacoma businessman who, at the time of his death, owned the largest private car collection in the world; he had over 3,500 cars. The LeMay-America's Car Museum has 350 of his cars from a wide range of car manufacturers and eras. Here visitors can see race cars from Lotus and Ferrari as well as a 1953 Citroen, a 1913 Daimler, a 1926 Ford Model T pickup, a 1929 Cadillac, a 1932 Packard, and a 1966 Ford Mustang. 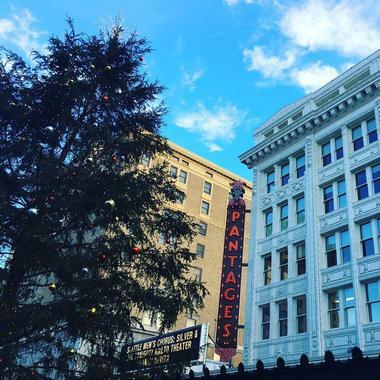 The Broadway Center for the Performing Arts comprises the Pantages Theater and the Rialto Theater, both completed in 1918, and the much newer Theater on the Square, which opened in 1993. 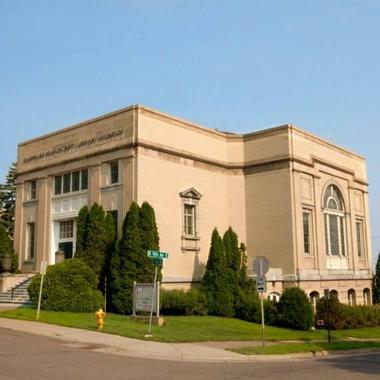 Set in Tacoma's downtown theater district, the Broadway Center is the home of the Tacoma Opera, Tacoma Symphony, Tacoma Youth Symphony, Tacoma Concert Band, Northwest Sinfonietta, and the Tacoma City Ballet. Over the nearly hundred years of its history, the complex has hosted great performers including Mae West, the Marx Brothers, Harry Houdini, Babe Ruth, Dave Barry, Bob Newhart, Victor Borge, and Jack Benny. All seats are good seats in the three theaters, and marvelous acoustics add to the on-stage acts. Dale Chihuly is a Tacoma native who is world-renowned for his unique glass creations. 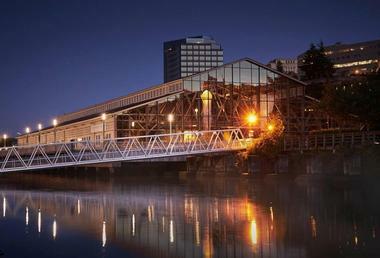 The 500-foot bridge spans Interstate 705 and the Foss Waterway; it is a pedestrian bridge and is partially covered. 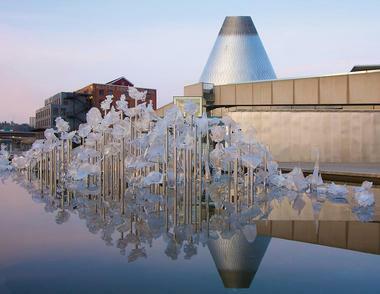 It links the Museum of Glass to Museum Row and Tacoma's downtown. The covered section of the bridge has a ceiling installment called the Seaform Pavilion, on which hang over 2,000 glass objects, giving the viewer the perspective of looking at a coral reef from below. Further along the bridge are towers made of blue translucent crystal, which capture and refract the daylight and which are illuminated from below at night. The final installation on the bridge is Venetian Row, an 80-foot wall filled with 109 glass sculptures, all of them museum quality. From the bridge, visitors have an excellent view of Mount Rainier and the city of Tacoma; there is no charge to cross the bridge. The Children's Museum of Tacoma believes that it is while playing that children learn the most. This museum was designed for infants up to the age of 8 and has several different playscapes for youngsters to explore. The Woods section of the museum has logs, elevated platforms, pulleys, and fort-building material, while the Water area supplies rubber aprons so that kids can use their hands to play in the running water and the waterfall. The Voyager is a ship with ropes to climb, wheels to turn, and a child's imagination to foster. 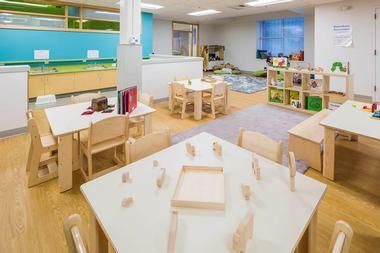 In Becka's Studio, there is plenty of equipment for messy, creative art projects, and the Invention Studio has blocks, boards, fabrics, and tubes for building, learning gross motor skills, and early math learning. The museum has a small snack bar, lockers for rent, and a strict no-stroller policy. 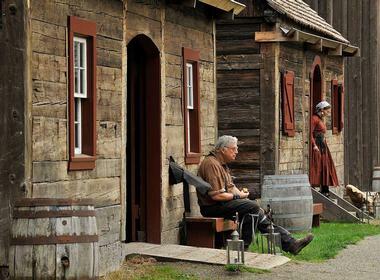 When the Hudson's Bay Company expanded to the west coast of North America, it was at Fort Nisqually that it based its fur trading and farming operations. Over the next few decades, local turmoil saw the fort fall into disrepair and finally close in 1869 as the fur trade waned. As part of Roosevelt's New Deal employment initiatives in the 1930s, the fort was restored; two of its original buildings, the keeper's house and the granary, are still standing. A trade store, a dwelling house, a kitchen, a kitchen garden, and a working blacksmith's shop have been added and, with the addition of costumed docents, the museum is now a great way to learn Washington history. There are many hands-on activities for both adults and children, including churning butter and baking bread. School groups are welcome. The museum has a small gift shop. The Tacoma Glassblowing Studio is a venture run by a husband-and-wife team and has been operating since 2006. Visitors to the studio can buy art from the beautiful pieces on display, admire the artworks, watch demonstrations of glassblowing, or enroll in classes. Classes fill up months in advance, but are worth the wait. The studio offers 1-day workshops, 4-week and 6-week classes, and private lessons of 2 or 4 hours in length. In the 1-day workshops, participants make glass pumpkins or glass tree ornaments. The glassblowing studio is known for its massive glass pumpkin patches, comprising between 1,000 and 2,000 pumpkins each, of all different sizes, styles, and prices. Job Carr was a restless man who was born in New Jersey in 1813. His strong abolitionist views led him to a 3-year stint in the Union Army, during which he was seriously wounded. He moved first to Indiana, then to Iowa, and when he heard that the government had authorized the building of a railroad to the Pacific Northwest, he sold up his land and became the Tacoma area's first European settler in 1864. While he built his cabin, he lived under a cedar bark shelter with his cat, Tom. What visitors see today is a reproduction of the original cabin, decorated as it would have been in the mid-19th century and furnished with antiques. Knowledgeable docents have much to tell about Job Carr and why settlers moved to the Pacific Northwest. For children, there are costumes to dress in and old-time toys to play with and the site is very popular with school groups. There is no charge for admission. California real estate magnates David and Marsha Karpeles amassed the largest private collection of manuscripts in the world, which they put on display in eleven locations across the United States. The goal of these museums is to stimulate cultural literacy, and the free admission makes the manuscripts accessible to anyone interested. 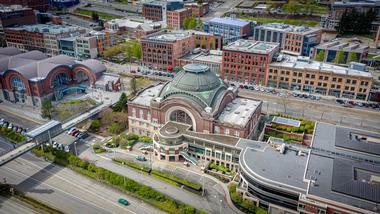 The Tacoma museum is a large Greco-Roman building across from Wright Park, and its exhibits change frequently. Founded in 1983, the museum has manuscripts of the Bill of Rights and others by such luminaries as Charles Dickens, Ludwig van Beethoven, Christopher Columbus, Ernest Shackleton, Charles Darwin, Albert Einstein, and Galileo Galilei as well as pencil drawings by Norman Rockwell. Harold and Nancy LeMay, both Washington natives, built a highly successful refuse business, collecting the garbage in five counties across the state. They also assembled the largest private car collection in the world. Part of their collection is housed at America's Car Museum, also in Tacoma, but the majority is at Marymount. Marymount was a boys' military academy run by the Sisters of St. Dominic from 1919 to 1975. They sold the property to the LeMays in the 1980s and both the grounds and the buildings have been maintained. There are 500 cars on display at any one time, and guided tours by extremely knowledgeable docents are available. There are not just cars, but also buses, military vehicles, motorcycles, buses, trucks, motorhomes, and unique custom vehicles. The museum is still overseen by Nancy LeMay and holds annual charity auctions. 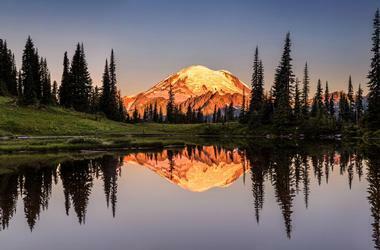 Mount Rainier National Park was the fifth national park to be created and was opened by William McKinley in 1899. It is immense, measuring 236,000 acres, while the mountain itself, the fifth highest in the United States, stands out from the Cascade Mountain Range at 14,411 feet. The park has so many diverse ecosystems, such as old-growth forests, gigantic glaciers, waterfalls, alpine meadows teeming with wildflowers, and deep gorges and valleys. It is home to an abundance of wildlife. Cougars, black bears, bobcats, deer, elk, mountain goats, and many other animals roam freely, while golden eagles, bald eagles, peregrine falcons, and spotted owls fly over the beautiful park. Visitors may hike, camp, climb, sled, cross-country ski, and snowboard through the park. Permits are required for overnight camping. The striking Museum of Glass, a conical building designed by renowned Canadian architect Arthur Erickson, has been a Tacoma landmark since its construction in 2002. The museum is a wonderful destination for all who love glass art, and its highlight are the glass blowing demonstrations. These are held in the 145-seat amphitheater and are narrated. The museum has permanent collections of 20th and 21st-century glass art as well as pieces from the Kids Design Glass program: glassworks made using the drawings of children as inspiration. The museum has a visiting artist residency program and works by these artists are also featured in the museum's collection. A fine gift shop and rotating exhibits round out the excellence of the Museum of Glass. Owen Beach is an ocean beach in Point Defiance Park. In the summer it is a marvelous place for swimming, sunbathing, shore fishing, dog-walking, or strolling along the paved seaside walkway. The beach has picnic tables in abundance, a picnic shelter that can be rented up to a year in advance, a children's play area, restrooms, and many concessions for buying food. 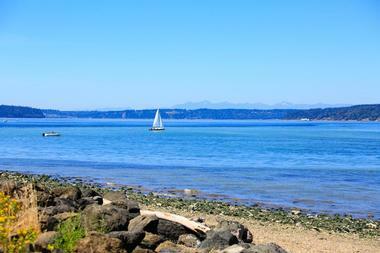 From the beach, there is a lovely view of Puget Sound and Vashon Island. Quite regularly, sea lions and seals come ashore to sun themselves. Regulations state that people must give the marine animals 100 yards of space and not approach them or allow their dogs to do so. Kayaks and canoes can be rented at a stand on the beach. Point Defiance Park, an urban park located on the banks of Puget Sound in Tacoma, Washington, has much more to offer than a typical city park. It has a zoo, an aquarium, a boardwalk, a lovely ocean beach, an off-leash dog park, a boathouse and marina, hiking trails, and a stand of old-growth forest that contains 450-year-old Douglas firs. The park also has a variety of gardens, including a rose garden, a Japanese garden, a dahlia garden, and a rhododendron garden. Wild animals live in the park, and visitors may sight bald eagles, seals and sea lions sunning themselves, mule deer, red foxes, and wolves. Ranger-led nature walks and workshops run throughout the year. Point Defiance Park is a popular special events venue, with the picnic shelters, Japanese pagoda, and rose garden available for rent. Point Defiance Zoo & Aquarium is home to more than 9,000 animals from 360 species. The zoo opened in 1905 and the aquarium in 1935; it has become a leader in the conservation and breeding of the endangered red wolf. The Asian Forest Sanctuary houses both Sumatran and Malayan tigers, gibbons, porcupines, and Asian elephants. In the Arctic Tundra exhibit, visitors can see polar bears, Arctic foxes, muskox, and reindeer. 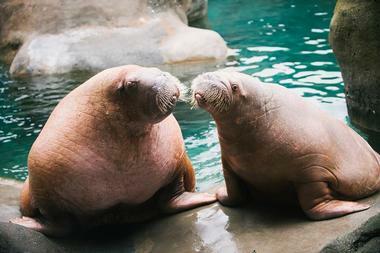 Harbor seals, walruses, sea otters, and puffins are the main residents of the Rocky Shore exhibit. The aquarium is divided into north and south Pacific sections and has giant octopi, sharks, fish, corals, and eels. It offers the unique opportunity of scuba diving in a shark tank. Daily animal talks and a fascinating children's zoo round out the offerings of this small but excellent animal park. Swan Creek Park is a greenspace tucked into the land between East Tacoma and Pierce County. The salmon-bearing Puyallup River runs through it, and it has lush wooded canyons, natural and paved trails, a community garden, and a newly built mountain bike park with more additions to it in the planning stages. 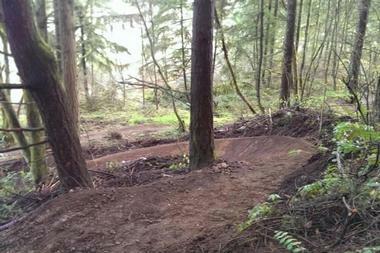 The mountain bike park welcomes non-motorized bicycles of all sorts, advises that helmets should always be worn, and is Tacoma's first and only mountain bike park. It has an easy perimeter trail called Hustle and Flow, while Ground Control and Major Tom are advanced trails, and there are four jump lines and a technical skill-building zone. Since 2007, Destiny Harbor Tours have been offering visitors and residents two different tours on their restored U.S. Navy Boats. The Puget Sound Tour takes in the Thea Foss Waterway, cruises by Old Town, looks at real working ships and tugboats, has terrific views of the city and its bridges, and is often able to point out local wildlife, such as eagles, hawks, herons, leaping salmon, and basking seals and sea lions. The Gig Harbor Tour departs from Point Defiance and travels to the Narrows Bridges and Salmon Bridge, providing impressive views of Mount Rainier and the Olympic Mountains. Groups of up to 33 people can be accommodated. Destiny Harbor Tours also offers private charters and is licensed for at-sea memorials, with or without the scattering of ashes. Asado Cucina Argentina is an Argentinian-themed steakhouse in Tacoma's popular 6th Avenue dining district. Latin American cuisine is served for dinner daily and for lunch Monday to Friday. All the beef on the menu is cooked in the display kitchen over a mesquite grill, wafting delightful aromas into the dining room, which is decorated in dark woods, metalwork, and a mural depicting Argentinian rural life. Appetizers include empanadas, ceviche, chorizo crab cakes, butternut squash soup, serrano-wrapped prawns, and fried calamari. Entrees range from mesquite-grilled beef and chicken to quinoa bowls, lamb shanks, pastas, sandwiches, and salads. 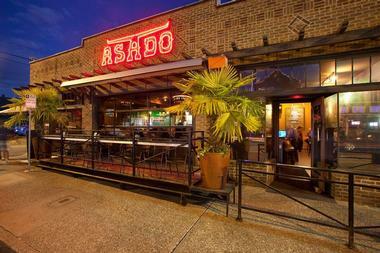 Asado also does full-service off-site catering. The Pacific Grill, in the heart of Tacoma's downtown financial district, was recently voted the best restaurant in the city, and also has won an award for best brunch. The restaurant is open Monday to Friday for lunch, Saturday and Sunday for brunch, and every day for dinner. The extensive menu relies heavily on beef and local seafood, including shucked oysters, smoked steelhead, pasta with prawns, and clam linguine. Desserts are decadent; the pastry chef conjures up daily specials in addition to such menu items as toasted coconut cheesecake, pumpkin tiramisu, and caramel apple creme brulee. Weekend brunches are called "Boozy Brunch" and feature bottomless Bloody Marys and mimosas. The Pacific Grill caters, delivers, and has private dining rooms for corporate and private events. 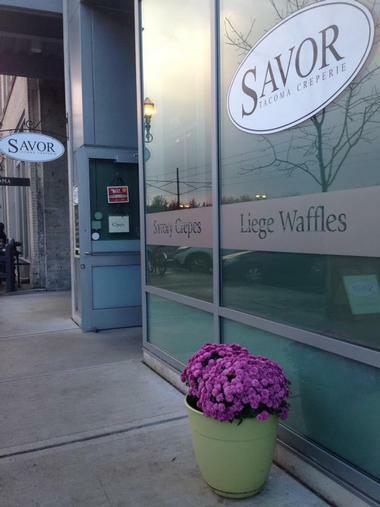 Savor Creperie is the brainchild of a French-Canadian chef who was inspired by French cuisine. This casual, friendly, bright restaurant is on the University of Washington campus, directly across the street from Tacoma's finest museums. The restaurant serves both savory and sweet crepes as well as Liege waffles. Savory crepes are served with a side salad and are made to order; options include butternut squash, ham and roasted asparagus, chicken and sundried tomato, egg and bacon, sautéed spinach, and shredded pork with mushrooms. The dessert crepes are also marvelous; some of the offerings include Nutella crepes, cinnamon apple, and warm mixed berries. Delicious French-pressed coffee is available, as are soft drinks, local beers, and wine by the glass. Gluten-free crepes are also on the menu here. 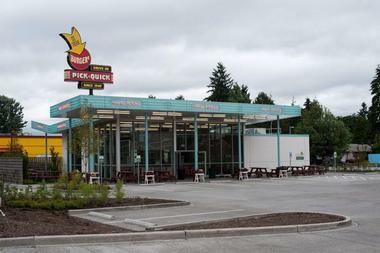 Pick-Quick Drive In Pick-Quick is a chain of drive-in restaurants that have been serving Washington State since 1949. They serve delicious fast food and pride themselves on using fresh, natural ingredients, sustainable packaging, and eco-friendly architecture. Diners eat in their car or on the picnic tables outside. The restaurant serves burgers, hot dogs, french fries and chili fries, beverages, and a variety of ice cream treats such as cones, sundaes, and old-fashioned malts and floats. Pick-Quick is a great place to stop if you want delicious food in a hurry and friendly, fast-paced service.